What is best way to organize a scene with different sets of materials? I am currently creating an interior scene and want to show different examples of wall/ floor materials to my customer. So I was thinking about how to organize my scene when I want to have different sets of materials on my objects. Right now I have about 15 objects that use the same wall material (partly on a few faces only) and 3 wall materials I want to show (paint, wood, tiles). ==> Is there a way I can create a linked object without linking the material? Second idea was to attach all the materials to the same object and change them by applying them in edit mode (I will have to create vertex groups for the faces I need). 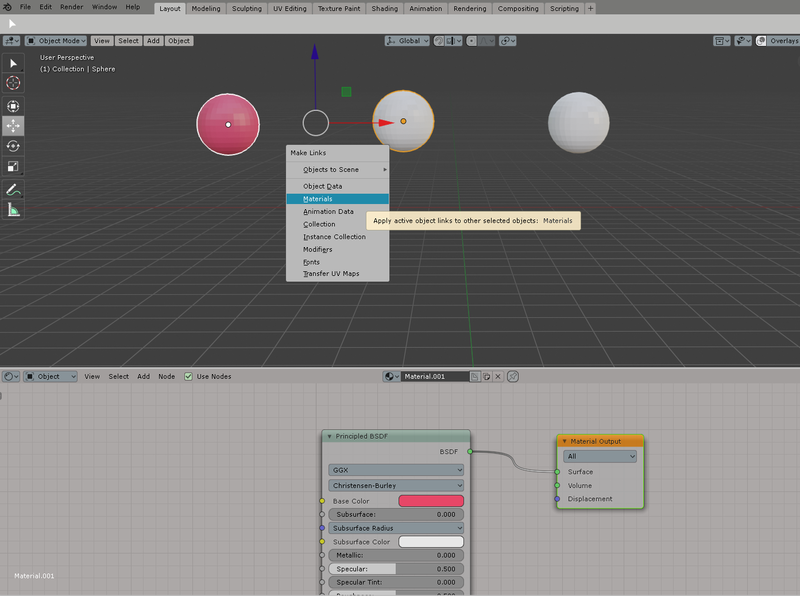 Third idea is to turn every material into a node group, then create a kind of master material (called something like "wall covering"), add all the node groups to this material and switch between them by connecting the node groups to the material output - node. Has anyone experience with any of these solutions or any new ideas? Are their any important pros/ cons I didn't think of? I am currently using the beta of blender 2.8. Thank you for posting your question so clearly. Yes, there is a better way to do this, specifically for Archviz. Create a SPHERE or GRID, apply desired texture material. On your scene, FIRST select your wall-to-be-changed-material, then select the sphere/grid you created to represent your material LAST. Hit CTRL+L (Link data shortcut) and select MATERIAL. Now, repeat for all geometry that will use that material. In my example picture, everything in the house that will use the PINK material, are "CTRL+L" (Linked) to that material. Have your material nodes ready and separated to connect EACH material into the corresponding "LINKED MATERIAL sphere/grid". This is how you can change materials amazingly quicker without the need to enter groups. This way you change all your properties visually -by literally interchanging- the material output connector. Notice the first thing is to link geometry to this other geometry which contains the TEXTURE. (1). Inside that material you have all your OTHER MATERIAL NODE GROUP options. 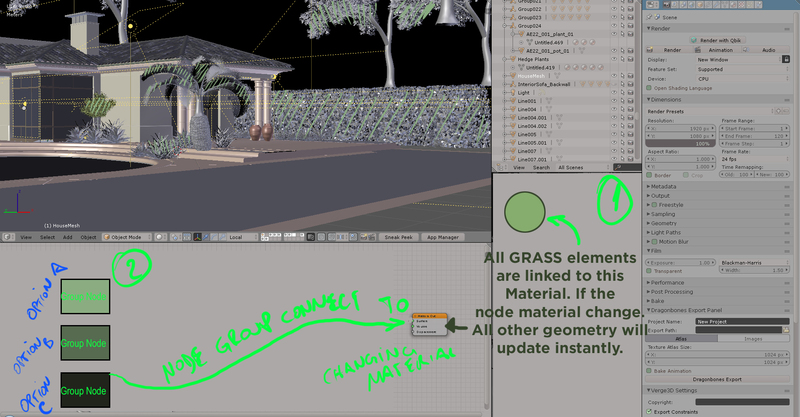 So it is easy for you to single connect (interchange connect) when you touch that material (for the sake of the example: I´m going to call the ball mesh material "GRASS", so I know all GRASS elements are depending (LINKED) to this material. Then, on the shader tree, I can have other NODE GROUP options to reconnect other option materials (2). 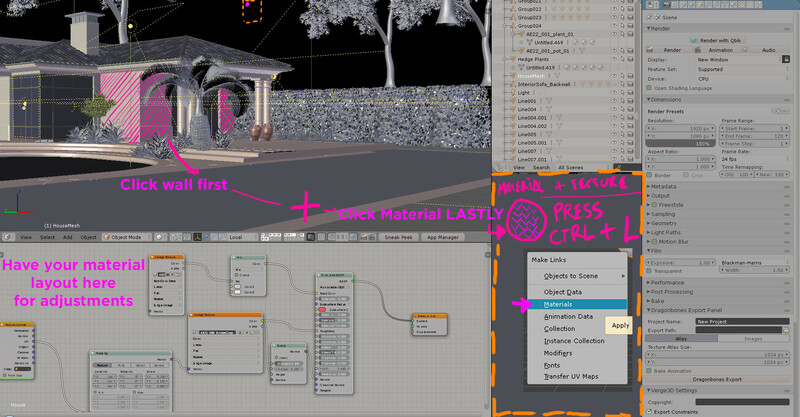 If asset library was here (Blender 2.8 new feature) we could do just "drag drop" materials on this LINKED mesh. But since we can´t now (feature probably available by May or later), then all we are left to, is to have the group nodes contained INSIDE the material, but not connected until you want to switch them. Thanks if you vote me up as ANSWER to your question. Cheers. Not the answer you're looking for? Browse other questions tagged cycles materials blender-render linked-data or ask your own question. Is there a way to see thumbnails of all the materials in a scene? What is the difference between duplicating and instancing an object, in regards to the materials they point to? How to merge around 300+ duplicate materials? What's the best way to build a GUI for non-blender users to control materials?